Designed for accuracy-minded shooters. Cast-iron base. 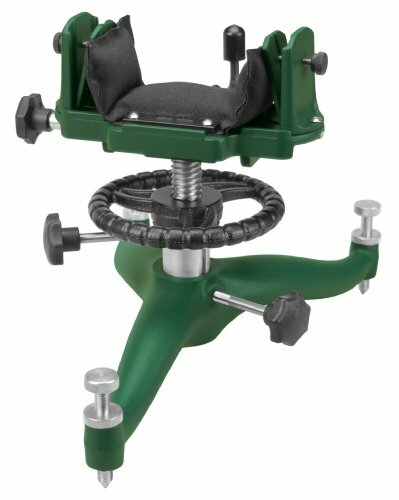 Windage-adjustable cradle for fast, smooth horizontal adjustments to handle wind shifts, especially appropriate for shooters using wind flags. Fine elevation adjustments made from large-diameter rotating wheel that glides on set of ball bearings. Coarse elevation adjustments made with locking collar. Cradle features sturdy bag tensioning system for excellent forend support, increase stability & accuracy. Specially designed slots for quick installation or Interchange of any of Caldwell's deluxe front rest bags to fit round-bottomed shapes. 2-stage elevation adjustment up to 11.5"